Think of sand and seaweed, and what immediately comes to mind? Gardening in sandy soil? I think not! Good memories, warm grainy sand in between your toes and water, water everywhere! Sun, bikinis, speedos....maybe we won’t go there! Wonderful ,friendly atmosphere, pure enjoyment! Right? 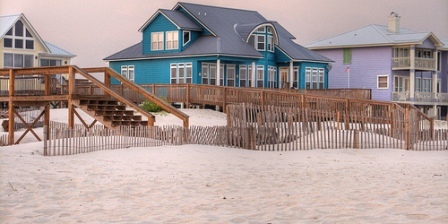 But what if all that sand is in your front yard! Now you are gardening in sandy soil! Do those same characteristics give you such warm and fuzzy feelings then? 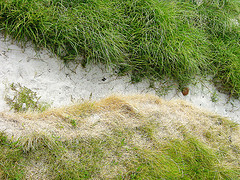 Yards are meant for grass, flowers, and trees…and there are not many of those on the beach! There aren’t even really any weeds! Just lots and lots of seaweed. Sandy soils are coarse, made up of tiny grains that do not bind well together, and as a result, if you are going to be working with sandy soils, you may have a drainage problem. However, your problem is at the opposite end of the spectrum from everyone else! Your soil may drain too quickly. Not only does Water drain very quickly through sandy soils, when Water leaves, it takes everything with it. Minerals, bacteria, microbes, sometimes even the soil! Dry as a bone washed up on …. you guessed it! The Beach! So how do you garden in sandy soil? need much more in the way of nutrients than are left with the exit of water from the soil. Luckily, there is a fix for that! Organic matter! Add LOTS and LOTS. And then add more. And keep adding, year after year after year. Eventually, your garden soil will begin to take on the characteristics of sandy loam, which is an ideal medium for growing things. To allow you to garden in sandy soils, you should set a target of achieving a high organic content in the soil. Adding organic matter such as peat, compost from your garden (or someone else’s garden if your soil is TOO sandy), aged manures, or even inorganic amendments such as vermiculite to the soils begins to improve the soil’s ability to retain water and nutrients. An additional step that can be taken in order to enable you to garden in sandy soil is to add mulch in generous proportions. Anywhere from 4-6 inches of organic matter top dressed and then mixed thoroughly into the sandy soil should do it. 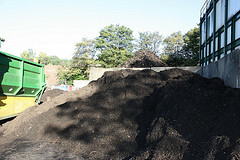 Mulches allow your garden to retain those vital nutrients and can vastly improve water retention. This can allow plants to obtain enough energy to complete their many tasks. Mulch also adds structure to the soil, which gives the plants something more to root in, therefore promoting stronger and healthier plants. In the short term, compost helps bridge the gap over the several years it will take to transform your sandy soil by adding organic matter to it. Gardening in sandy soils can be a challenge, but with proper mulching and the addition of plentiful levels of organic matter, gardening is very possible. And on an even brighter note, pulling weeds is a breeze!